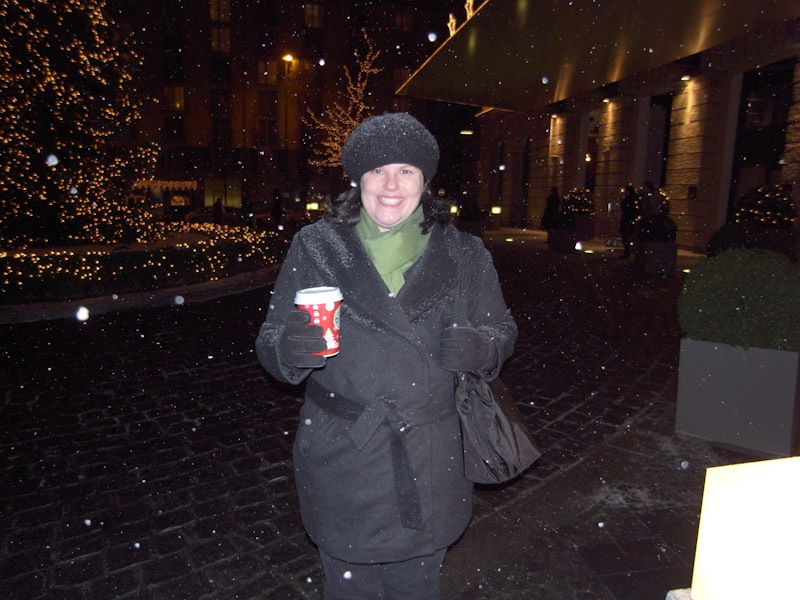 Laura enjoying the snow and a hot chocolate after dinner. It had actually warmed up quite a bit from earlier. 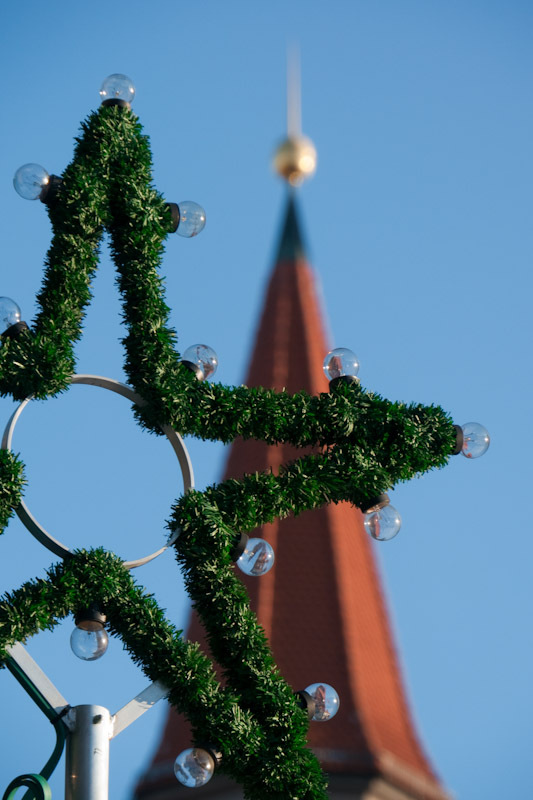 After living in the tropics for six years, coming to southern Germany in December can be a shocker. We thought we were prepared, but I guess we weren’t. We have been layering and layering on the clothes and coats to try and find some warmth. We finally found some in a hot cup of gluhwein. Gluhwein is a mulled wine, served warm. Nearly every other stall in the Christmas markets sell the warm drink. You pay about $5.50 Euros for a mug and then get back $3 Euros when you return the mug. I guess the deposit keep all the mugs from walking off as a souvenir. 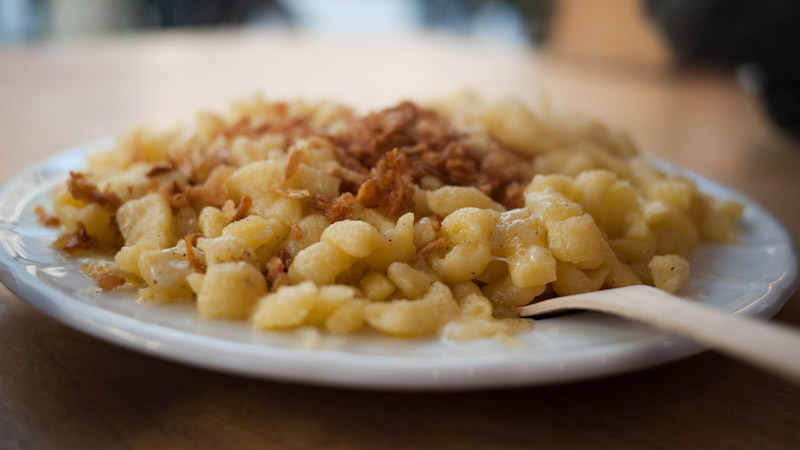 Some spaetzle and cheese, perfect! We spent the first part of the day meeting up with some friends from work that were also in Munich this week. After a hot chocolate and some quick catching up we were off to the Christmas markets that are scattered around the inner city. A huge part of Munich city center has been designated a pedestrian zone, so it makes walking around quite nice. After about 3 hours of being out we headed back to our room, warmed up, and got ready for our next outing. With the beautiful, clear blue skies comes the cold weather. 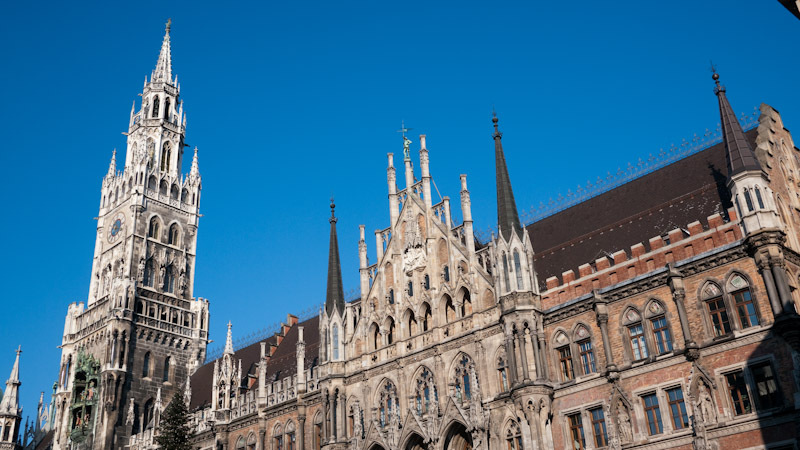 The Glockenspiel from the Marienplatz. The blue skies today were amazing. After warming up a bit we headed back out to stroll the streets and find lunch. There were too many choices to choose from, so we ended up just getting small portions and trying several different things. 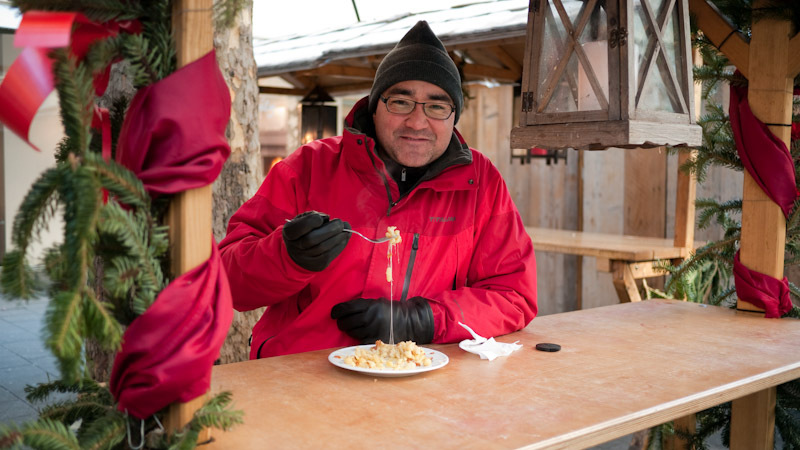 Spetzle with cheese, bratwurst on a roll, a buttered pretzel, some leberkase, a crepe and gluhwein kept us going all day. 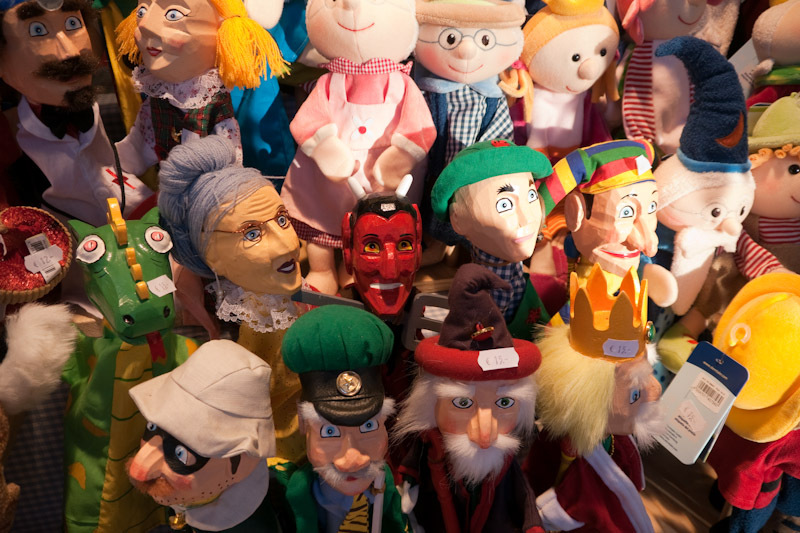 A few pupets and a Christmas market stall. All of the shops in the pedestrian zone were closed so there wasn’t much shopping to do. We walked through a church, looked at the frozen fountains, walked around some more and then decided to call it a day. After another short rest we headed back out for a light dinner and to our surprise it had started snowing while we were having dinner. It’s been a long time since we’ve been in the snow. 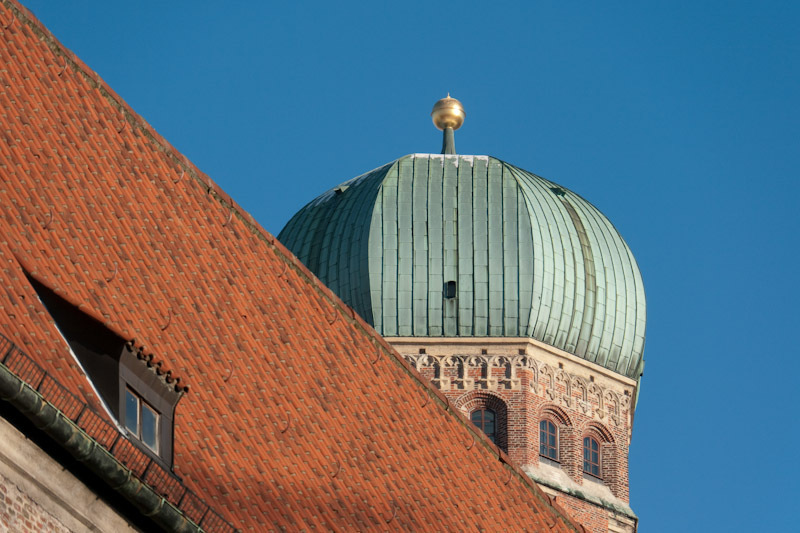 Now we’re in for the night and resting up for another day strolling around Munich.